This summer, the gang at NPR music is taking a break from some of their regular haunts (the 9:30 Club, Bob Boilen’s desk, SXSW), to bring their indie friendly sounds to some select US cities. The tour kicked off in NYC on June 11 at The Living Room, but the good news is (for those of you who missed that show) that they’re coming to The Bell House in Brooklyn on Aug 13. 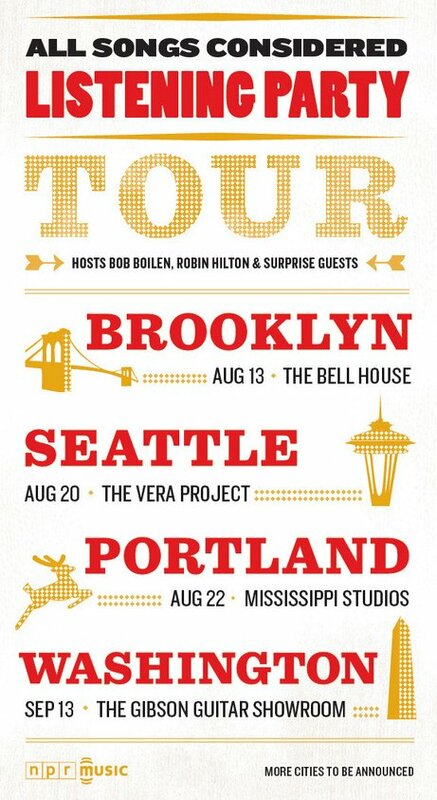 Also, if you live in Seattle, Portland or Washington you can catch* Robin and Bob and special guests on Aug 20, Aug 22 and Sep 13 respectively. * Free tickets are already sold out though.